For years, my husband worked at a company that had an in-house cafeteria where they served what he called “apple crisp without the oatmeal”. He would always ask me to make it, but I had no idea what he was talking about . . . every time he’d ask, I’d tell him to get the recipe from the chef . . . but he never did. 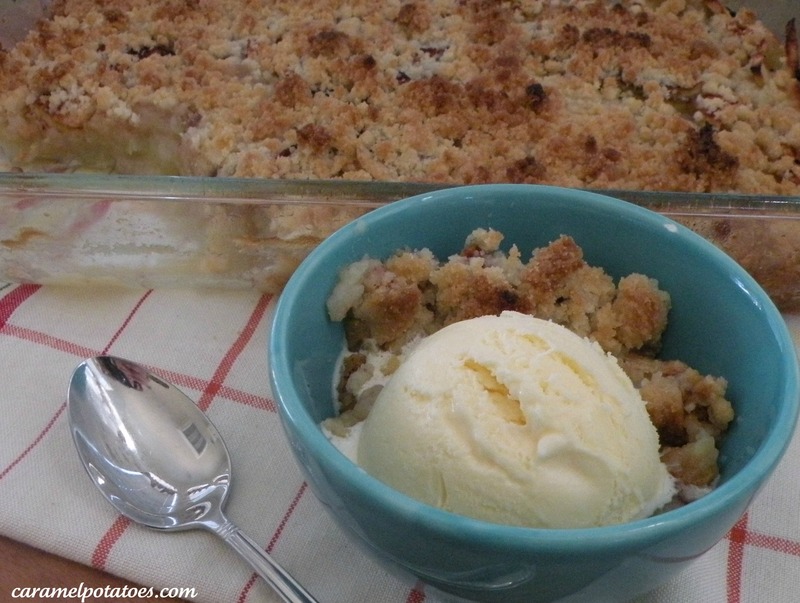 Then one night I went to book club and the hostess served this wonderful apple crumble – Bingo! This must be his apple crisp without oatmeal! Sure enough and it is one of his favorites! Place apples in a 9×13 baking dish (enough to fill baking dish to about an inch of the top) . Sprinkle with cinnamon and pour 1/3 cup water over the apples. For the topping, combine the butter, sugar and flour and crumble over the apples. Bake at 400 for about 35 minutes, or until the apples are done and the crumble is browned. I found your website through yoyomax12..Im browsing through your page and my big thing is dessert recipes~.. Im a big sucker for desserts..lol.